Digital Home Thoughts: Contest Time, Win a Gomadic Charger ! 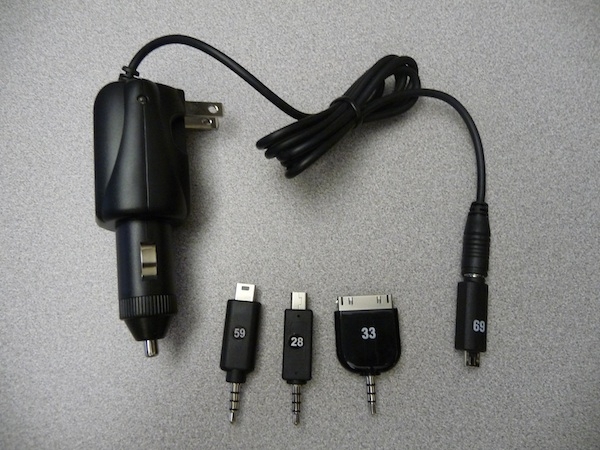 Contest Time, Win a Gomadic Charger ! The Gomadic chargers are very slick, and we recently did a Quick Look on the 2-in-1 Charger pictured above. If you aren't familiar, the system uses what they call "Tip Exchange" so all you need is one cable and a tip for each device, instead of having to carry around separate charging cables. They pretty much cover every device know to man, or at least it seems that way (the brand list is here). Now the folks at Gomadic are being generous enough to give away four (4) of their 2-in-1 Charging cables as well as two tips to be chosen by each winner. Since Gomadic has such wide coverage on devices, this is a network-wide contest. To win, all you have to do is go to the Tip Exchange page and pick two of the charging tips you want to go with your 2-in-1 Charger. Post the two numbers along with a reply to this post and you are entered. You MUST post the two tip numbers in your reply or your entry won't be counted. One post per person, and the contest closes on Friday the 19th of March at 12pm Pacific time, GMT -7. This contest is world-wide with Gomadic providing the shipping. Remember that all first posts in our system are held in moderation, so if this contest entry is your first post, please wait up to 48 hours before getting concerned if your post hasn't shown up yet - it will. Winners will be contacted via private forum message, so have email notifications turned on. Winners will have 72 hours to claim their prize.